When replacing an existing tar-and-gravel roof, the roof removal process basically requires tearing off a bit of roof at a time. So each part of the roof that is opened up exposes the building occupants, contents, structure and operations to risk. It’s time-consuming for installers to roll out material, cut and splice to fit corners and angled areas, and piece it together around penetrations. Then, you pay to truck all of the old roofing waste to the landfill. Because SPF roofing is so lightweight and it can be applied in varying thicknesses, you can usually install it without having to remove the old roof. Instead of creating tons of waste, a sustainable SPF roofing system conserves natural resources while saving money on fuel, freight and landfill costs. And to further avoid disposing of usable material, we always evaluate any existing insulation for potential reuse. In many cases, we can spray foam over it and add to its insulating value. Plus, in the time it takes an ordinary roof installer to cover one penetration, SPF can be installed on an entire roof, reducing labor costs. How much can you save overall? The costs of tearing off an old conventional roof and installing a new one on a commercial building will run upwards of $20 per square foot. 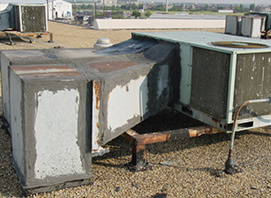 At an average of $5-$12.50 per square foot, it’s far more cost-effective for DFW Urethane to reroof with our SPF system. That’s some serious green right there! Our fast and efficient installation process is less labor-intensive – and less disruptive than replacing a traditional tar or asphalt roof. Yet, it’s fully customized to address each facility’s specific roof and needs, such as adding slope to improve drainage. For tar-and-gravel and BUR roof jobs, we remove loose gravel and blisters, then spray the entire roof with polyurethane foam to the designated thickness. This is followed by a base coat of high-performance elastomeric coating. Depending on the project, the roof may also get a mid- coat of the elastomeric coating to add thickness in high-traffic areas. Finally, we apply a bright-white ENERGY STAR-rated topcoat that protects against damaging ultraviolet rays and absorption of radiant heat. What’s more, SPF roofing systems minimize roofing-related health risks. Unlike a lot of asphalt, polyurethane foam contains no formaldehyde, CFCs or other substances that deplete the earth’s ozone, adding to its green benefits. 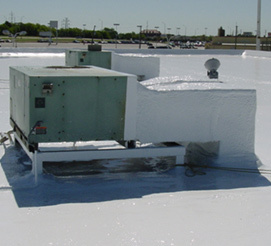 SPF roofing is also an approved method of encapsulating asbestos, which is still present in some asphalt materials, even when performed by qualified contractors. What also makes our SPF roofing systems “green” is their extremely long life with minimal maintenance. With pressure washing and recoating every 10-15 years, it can last indefinitely. No tear offs and no new foam necessary. Now that’s a truly sustainable reroofing solution!